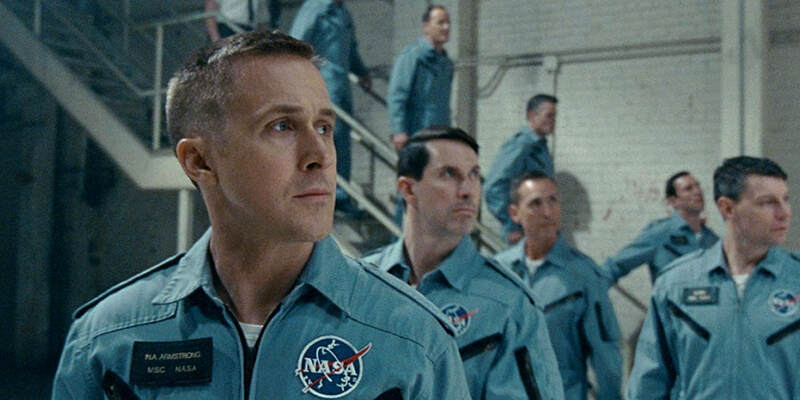 THE STORY - On the heels of their six-time Academy Award®-winning smash, La La Land, Oscar®-winning director Damien Chazelle and star Ryan Gosling reteam for Universal Pictures’ First Man, the riveting story of NASA’s mission to land a man on the moon, focusing on Neil Armstrong and the years 1961-1969. A visceral, first-person account, based on the book by James R. Hansen, the movie will explore the sacrifices and the cost—on Armstrong and on the nation—of one of the most dangerous missions in history. THE GOOD - Amazing direction, editing, cinematography, sound and score coupled with a strong subdued performance from Ryan Gosling makes for a visceral cinematic experience. ​​Tackling Apollo 11 might seem like an unusual move for Damien Chazelle to take following his Oscar-winning musical one-two punch of “Whiplash” and “La La Land,” but on some level, it makes sense as the conclusion to the initial Chazelle trilogy. It has a driven male protagonist who proves almost machine-like in his goals. It is white-knuckle stressful. And during at least two points in the film, Ryan Gosling plays jazz music. However, like Chazelle’s previous two films, his direction is much stronger than the writing. “First Man” dutifully recreates the decade-long journey to put a man on the moon through the eyes of a stoic Neil Armstrong (Ryan Gosling). As if the physical challenges weren’t enough, Armstrong must also navigate a tumultuous relationship with his wife (Claire Foy) and master his lifelong grief stemming from his first child’s death. Neil Armstrong, at least as portrayed in the film, is a closed-off character. He seldom cracks a smile. His responses to questions are laconic in nature. He is driven and focused. As such, screenwriter Josh Singer pens a screenplay that mirrors its protagonist. Like his work in “Spotlight,” “First Man” is business-like, offering a journalist’s attention to detail and matter-of-factly stating the film’s events as they occurred. He stuffs the film full of side characters portrayed by an amazing array of actors including Jason Clarke, Christopher Abbot, Kyle Chandler, Corey Stoll, Ciaran Hinds, and Brian D’Arcy James but in the film’s determination to stuff ten years worth of history into a two hour runtime, it fails to allow any of them (with the exception of Clarke) to make much of an impression. Almost docu-drama in nature, in Chazelle’s gifted hands, the film is still engaging. Chazelle completely upends his usual visual style, opting for a cinema verite handheld aesthetic this time around. But don’t worry, there are still plenty of striking images. The combination of his energetic directing, Linus Sandgren’s dynamic camerawork and Tom Cross’s propulsive editing transforms Singer’s cold screenplay into a full-force suspense picture. Even knowing exactly how the film will end, the claustrophobic flight sequences keep you on the edge of your seat. Justin Hurwitz’s thumping score gets your heart racing and the impeccable sound design makes you flinch and shudder with every creak, groan and hit. Like “Whiplash” before it, the film leaves the viewer feeling almost punished by the sound. It is a technical masterpiece, with every craft aspect functioning at 110% and all working towards a singular purpose: to pound you into submission. At the center of all this is Ryan Gosling. He plays Armstrong like the main character in “Drive.” Quiet and stoic but with occasional flickers of emotion. Gosling works wonders with his eyes, offering shades of Casey Affleck in “Manchester By The Sea” in his suppressed grief stemming from the death of his first child. Claire Foy elevates your run-of-the-mill “wife at home” role, depicting both quiet simmering rage and deep compassion. Unfortunately, her biggest scene is undermined by her consistently wobbly accent. In short, “First Man” is a showcase for Chazelle’s remarkable abilities as a technical director and for his amazing crew of below-the-line collaborators. The film is neither as emotional as “La La Land” nor as stressful as “Whiplash” but that doesn’t mean it doesn’t leave an impact as it feels stuck somewhere between both of those two films. Even if it doesn’t reach the heights of Chazelle’s previous films, it proves the director can elevate anything, even a rote, mechanical screenplay like the one at the film’s center into a visceral thrill ride.